Brush your dog or cat's teeth on days that you will remember, like Friday night or Sunday night. You'll always remember the end of the week and the day before the workweek begins. Brushing daily is best but even a few times a week can make a big difference. Plague builds up without brushing, causing bad breath, gum disease, and possible tooth decay. 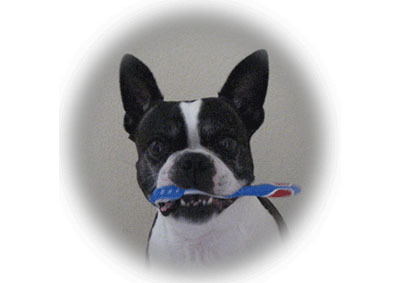 Use a soft bristle toothbrush specially made for dogs or cats. The toothbrush is great for larger dogs; they have longer handles and are specially angled to reach into a large dog's mouth. A small soft bristle toothbrush works well on cats and dogs less than 30 pounds. Be sure to use only toothpaste that is made for dogs. These toothpastes come in a number of dog or cat-friendly flavors. Never use human toothpaste; it contains ingredients that may be harmful to your pet. Find a position that your pet is comfortable in. This procedure can't be rushed; your pet will sense it and feel threaten. Be patient and don't expect too much from your pet on the first few tries. (Keep in mind this whole process could takes months before you achieve a complete and successful tooth brushing session).Try sitting or kneeling down on the floor in front of or beside your pet before you begin. Test your pet's willingness to cooperate. First rub your finger along your pet's gum lines, both upper and lower using a gentle touch. This basic step may be the only step you try for a couple of weeks until you pet is comfortable with you touching his or her mouth. Then apply pet toothpaste on your fingertip. Let your pet lick the toothpaste from your fingertip. If after a few days your pet refuses to lick more toothpaste after her initial taste, try a different flavor. Hopefully, you'll find one your pet will enjoy. When your pet gets used to you touching his or her gums and mouth, start using the toothpaste and toothbrush or finger brush together. You may start by brushing only a few teeth at a time and then stopping, (This will reinforce that this isn't such a bad experience.) Start with the canine and back teeth; this is where most plaque tends to collect. Lift the upper lip. Start lightly brushing by angling the bristles to reach your pet's gum line. A 45 degree angle against the teeth and gum line will clear away the plaque. Next use small circular movements on both top and bottom teeth. At the beginning of your home care you may note slight bleeding which should go away as the gums improve. Heavy bleeding may indicate that you could be using too much pressure while brushing. Consult your veterinarian if any heavy bleeding continues. The insides of the teeth should be the last step in brushing and your biggest challenge. If you are unable to brush the inner teeth, remember that a dog or cat's coarse tongue will help keep the inner teeth clean. Only attempt the inner teeth if your pet is extremely cooperative. Again, brush in small circular movements.